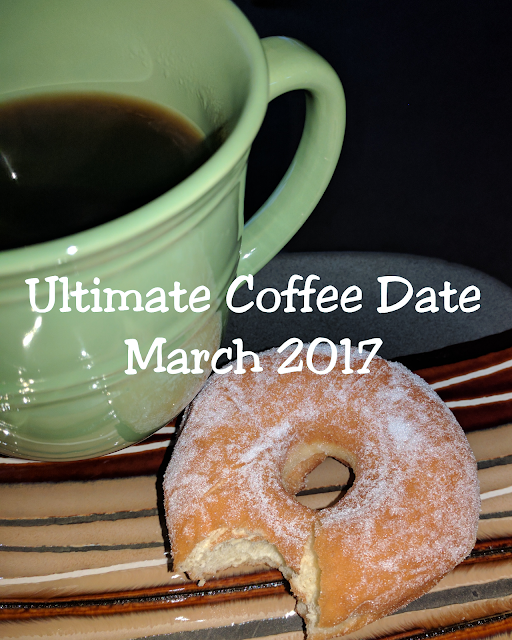 I missed our coffee date last month, and that made me sad, so I decided I wouldn't miss out again this month! If we were having coffee today, I'd tell you that I've decided to forego my goal of running a 55k at the beginning of April. I probably wouldn't want to go into too many details about it. It's kinda fresh. But let's just say that other goals are taking a priority and with my knee acting up, I don't want to push it too hard and risk more serious injury. I'd tell you that I spent some time this morning writing out a workout plan for March. My plan is to really focus on Core and other strength and/or endurance workouts, so that I can get stronger for that possible Grand Canyon hike. I'll only be running 2-3 days a week, with some hiking or biking thrown in. I'm also going to start a 30 Days of Yoga for Beginners playlist on YouTube. I was very specific with exact videos/workouts I want to do, so I won't need to waste any time figuring out what to do each day. It's a pretty solid plan with working out or running in the mornings and yoga in the evenings. I'm hoping that Jeff will do the yoga with me (or at least some stretching while I do the yoga) in the evenings. I don't normally do 2 workouts in one day, but I'm tired of being so lazy in the evenings. If we were having coffee today, I'd remind you that I'm so excited to be an aunt again. The last time I became an aunt was in 2002! My two youngest brothers each welcomed a baby boy at the end of February. I would definitely show you pictures that my brothers and their fiancées have shared on Facebook. If we were having coffee today, I'd tell you that I got to have lunch with a former co-worker yesterday! It was so much fun, plus I got to hold her little 6-month old. She's adorable! I'd also tell you that we got to talking and totally spaced snapping any pictures. I hadn't seen her in probably 9 months, so hopefully it won't be quite as long before I see her again. If we were having coffee today, I'd tell you that I've decided I really like butternut squash. We got some in a recent Bountiful Basket. I peeled it, cubed it, and then roasted it. So delish! I ate it as a side, in a smoothie, and in a salad. I'm blown away by how much I like it. I really don't remember liking it this much. LOL. Oh, one last thing! I'd tell you that Jeff and I are heading out for a bike ride this afternoon. We haven't gotten in the saddle for MONTHS! I'm excited to get out there. Plus, it's gorgeous outside right now, and I don't want to stay cooped up inside all day long!! Have you ever set out with a BHAG - only to re-evaluate and change your goal in the middle? If we were having coffee, what would you want to tell me? 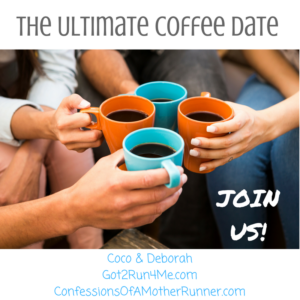 Be sure to head over to Got 2 Run 4 Me or Confessions of a Mother Runner and catch up with everyone else! Your smoothie bowl looks yummy! lol- about your smoothie comment- no knowing what one is- I always have the same exact feeling! I know smoothies, and I like the drink them- Is it just pouring it in a bowl and adding stuff on top! From the comments on that post, YES, it is just as simple as that. :-D Who knew?! I share your fondness for butternut squash! When you cut back on sweets the way I have, BS tastes SO delicious. Congrats on the new additions to the fam! I heart butternut squash! I make an amazing pasta sauce with just butternut squash. Yum! Ooh! I bet that is really good. I tend to have laser like focus on a goal & be like a dog with a bone -- which isn't always good, but it's my nature. Just ask my husband. Your plan sounds like a good one. I tend to do shorter workouts more frequently, but I can do that since I'm retired. And I love butternut squash, especially roasted. LOL! I can get like that sometimes, but sometimes I just have to listen to my body. The weather is beautiful and a great time to get back in the saddle! Kudos to you for reworking some goals and creating a new plan- nothing wrong with that! and yes, I am a huge squash fan! Congrats on the new additions to the family ! I haven't fixed butternut squash yet this year. I think I like it more than sweet potatoes, actually. Have you been to the Grand Canyon before? We went to the south rim two years ago and loved it! I've got a few posts on the blog, but they are mostly pics, so email if you have questions! I am not a fan of sweet potatoes at all, so I'd say that butternut squash is WAY better. LOL. Jeff and I visited the South Rim a couple years ago, but we didn't do any hiking. It was just an overnight trip. So gorgeous! I'll check out your posts. My husband and I visited the Grand Canyon years ago and regret not hiking down into it. It sound like a fun trek! My husband and I went a couple years ago, but didn't do any hiking, either. This would be an amazing experience! Good job getting a workout plan for the month. I will be setting up a plan for my NYC Marathon training in the coming weeks. Meanwhile, I'm focused on a lot of cardio and need to add in strength again. Hope you had a great bike ride and weekend! The bike ride was short, but so much fun! I'm glad we finally got out there. It had been way too long. Squash in a smoothie.. that sounds interesting - and healthy!! I loved the Grand Canyon - can;t wait to go back... one day! I love butternut squash too but I never buy it! The possibilities are endless with it, so tasty! Sorry to hear you're no longer doing the 55K in April but it sounds like you've got a great game plan moving forward! I need to do more yoga myself! We started getting Bountiful Baskets again, which is a bi-weekly coop. I probably wouldn't buy butternut squash on own (can't quite convince my husband to give it a try). Yay! Catching up with old friends is awesome! Definitely need to try it. :) I was pleasantly surprised.